More often than not, it is the small things that contribute to making a wedding fun and memorable. And the tradition of kaleeras is indeed a special affair, not just for the bride, but even for her family and friends. That’s not all. The kaleeras are an important part of the wedding festivity as they are a symbol of blessing from the bride’s family and therefore have a lot of emotional connect to them as well, so buying them is indeed a special affair. Now, you might think that buying kaleeras is no big deal. Unfortunately, however, most designs in the market are either really old school or too over the top for a modern bride. The result? Endless confusion and you end up buying something that has no real connect with you. You can also get mini charm kaleeras to tie onto the bride as a blessing. If you have friends or cousins getting married, what could be more special than tying a personalised kaleera to bless them on the morning of the wedding. 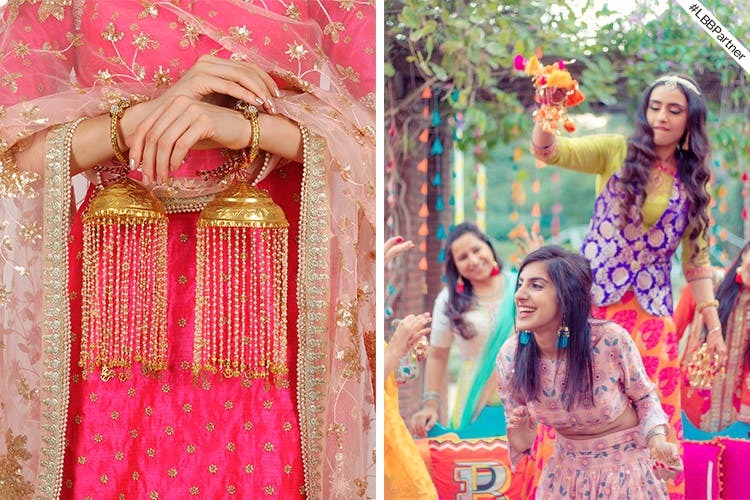 The best part of the kaleeras from The Wedding Brigade is that they have taken the traditional kaleera and made it more personal and meaningful for each bride. Each kaleera style has different ‘charms’ to it, each of which signify a special blessing because ultimately, that’s really what kaleeras are about, right? Have you chosen which one to buy? We have you sorted with some options below. These kaleeras are a sign of infinite health and prosperity. With an interesting design, this one is sure to add a unique element to your wedding celebrations. One of those who’s always doodling hearts in her spare time? This one is perfect for the romantic bride as these heart kaleeras are designed to represent a blessing of endless and eternal love. If you believe that prosperity and enlightenment are the foundation of a successful marriage, we think that this pair of kaleeras is something that you should get your hands on, right away. Also how pretty would those dangling lotus flowers look against your lehenga! Nothing signifies good vibes and pure energy better than the Om symbol, so this pair of gorgeous Om kaleeras are perfect if that’s the blessing you want to take into your new life. It’s also great to pick this up for someone in your family! The ghungroo kaleeras signify positive vibrations and not only look so delicate and pretty, but also make that beautiful sound we all love. After all, it is small things like these that every bride likes to cherish forever. But remember, one of the most special bits about the kaleera-wearing tradition is the ceremony where the bride’s family and friends tie small kaleeras to the main one. Yup, the Wedding Brigade Kaleera collection has something for that too! You can get the mini charm kaleeras which you can tie onto the bride as a blessing that you want to give her making it all the more personal! Lots of cousins and friends getting married? What could be more special than tying a personalised blessing onto their kaleera on the morning of the wedding. See the mini and full kaleeras here. Find out more about The Wedding Brigade here. This article is in partnership with The Wedding Brigade. What’s in trend today may not be in trend tomorrow. So focus on making your wedding affair more personal, so that you can create memories, with the people that really matter, which is your family and friends.